There are a lot of expectations for a high school athlete when they explode onto the scene as a freshman, winning at the highest level and capturing All-State honors as ninth graders. But the best of the bunch, those who use the talent given to them as a template and then tirelessly work to improve while also being gifted with the mental aptitude to overcome external pressures, can manage to reach new heights as their prep careers progress. Take Cherry Hill East High School junior Grace Yoon, for example. An All-State performer as a frosh, winning the 100-yard breaststroke at the Meet of Champions, Yoon repeated both of those feats last spring (tied for first with Audubon’s Nora Woods in the breaststroke, with a time nearly a second faster than her first-place finish as a freshman) while collecting a Meet of Champions crown in the 200-yard individual medley (a time of 2:02.51), too. Some sophomore slump, huh? 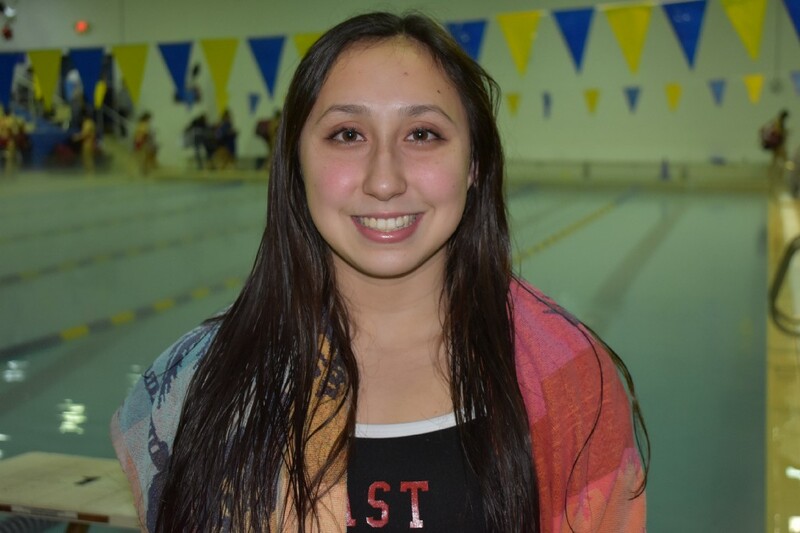 Yoon has been off to the races again since her junior swimming season at East got underway: she finished in the top five in several events at the Team Pitt 57th Annual Christmas Meet at the University of Pittsburgh last month, placing second in the breaststroke. Yoon and her deep Cherry Hill East team — the Cougars finished second in the state to Bridgewater-Raritan for the Public A title — should continue to be a force to be reckoned with for the remainder of the 2018–19 season. And with graduation still more than 16 months away, Yoon should be able to add a lot more hardware to her already impressive championship resume. Following her team’s recent 117–53 win over previously unbeaten Rancocas Valley, Yoon took part in the latest edition of the Sun One-on-One. The Sun: So your freshman year you won one Meet of Champions race, last year you won two. What’s in store for this year? Yoon: Well in none of those years was it my intention to go and win, this meet has always been a fun meet and I think it allows me to do my best. And that is a really exciting part of it, but it’s not my goal in any sense, it’s not my main objective of that meet. The Sun: You’re trying to beat personal bests, that stuff. Yoon: Yeah, I just think that meet is an opportunity to do the best for myself because the competition is really strong and it’s at a good point of the season. The Sun: How much would it mean to win a state team title for Cherry Hill East? Yoon: That’d mean so much to me. We’ve been so close the last two years, but I think we just keep getting stronger each year. The Sun: Do you have any swimming role models? Yoon: One person in particular was someone I swam with on my club team, her name is (Moorestown High School graduate) Andrea Fong, she swims at Villanova now. She really showed me what it means to be a great teammate and to this day I still look up to her and try to emulate her characteristics. The Sun: When did you learn how to swim? Yoon: When I was really young, my parents taught me in a recreational pool down the shore. Long Branch, kind of central/north Jersey. The Sun: Did you move down here then at some point? Yoon: No, we always went to the beach there because that’s where my family lives. The Sun: Do you have siblings? Yoon: I have two younger siblings, Grant (14), and Jewel (11). They swim, but they have other interests that are more important to them. The Sun: Did your parents swim? Yoon: No, they did not swim. The Sun: How did you get into it? Yoon: I started swimming at Wexford in the summer, since I was pretty young, probably six, maybe even younger than that. And I just kind of stuck with it. The Sun: One thing I’ve noticed about Cherry Hill East is it seems like there’s always new talent coming up. Last year your second-team All-State 200-yard relay team of yourself, Brianna DiSanti, Annie Behm and Karolyn Merch were all underclassmen and Ashley Ong was also a standout freshman last year. Do you like that, the constant flow of youth onto the roster? Yoon: It definitely makes it really exciting, especially when you’re waiting for the season to start because there’s a lot to look forward to. It’s awesome to watch the freshman and sophomores do so well. Now that I’m a junior I have the perspective of looking at it as an upperclassman. But it definitely gives a different life to the team. The Sun: Do you feel more like a leader as a junior then? Yoon: I feel like I’m more self-confident in what I’m saying. I’ve learned to talk slower — maybe I’m not talking slower right now. [Laughs]. As a teammate, I feel like one thing I’ve gotten better at, personally, is racing, so knowing all of the people I’ve been swimming against from club swimming and swimming at East for three years, if I’m trying to win a race or help my team in any way, I know what to expect and know what I have to do. As a teammate, I also think I’ve grown as a supportive teammate. I try to I guess just motivate (my teammates). The Sun: Mixing it up, a little bit: if you could form a relay race with three other girls from South Jersey — and you can’t pick any East teammates — who are you picking? Yoon: Ooh, well, this is tough. Probably some of my club friends. I don’t know if I could pick three. The Sun: OK, pick four or five. Yoon: OK, I’ll list some. Erin Cavanagh is my best friend. She swims at Bishop Eustace. Another one of my friends is Holly Robinson at Moorestown. And Margot Kaczorowski from Haddon Heights. And someone who doesn’t technically swim for our swim league is (Allison) Fenska, she swims at Moorestown Friends School. I love swimming with those girls, so that’d be fun. The Sun: Do you have a favorite team or opponent to swim against, someone who pushes you? Yoon: Erin. I love racing her because we’ve probably been racing against each other since middle school. So, we’ve always been close. The most fun races I’ve ever had is when we’d tie. If one person wins on race, the other will win the next time, so it’s always been back and forth. That makes it really exciting for us. The Sun: Do you hope to swim in college I assume? The Sun: How is that going, are you being heavily recruited, looking regularly, what’s going on? Yoon: It’s changed and the recruiting starts a lot earlier now … my family has never gone through anything like this so it’s new to my family and obviously it’s new to me since I’m the oldest. It’s both exciting in a positive way and exciting in an anxious way. The Sun: Right, I’m sure it can be stressful. Maybe your friend at Nova can give you some advice or guidance. The Sun: Do you know what you want to study yet in school? Yoon: I’m not sure yet, but probably something in in the sciences. I’ve grown up around science my whole life, my parents, from being interested in the subject. The Sun: Back to swimming: who is your funniest teammate? Yoon: Ooooh, I don’t know. There’s definitely a lot of people who bring a lot of life to the team, so I can’t pick one. It’s hard to pick. There are too many teammates, so many to cheer the team on and make people laugh. It’s just a good group. The Sun: Who is your smartest teammate? Yoon: I’m not going to answer that. The Sun: [Laughs] You don’t like to single out people. The Sun: One more — what teammate would you feel safest getting into a car with? Yoon: This is a good question. I’m not driving? The Sun: No, someone you’re riding with, you’re in passenger seat. Yoon: Probably Lily Smith. I’ve known her since we were swimming when we were really young, so I’ve known her for so long. But I would be comfortable with anyone on the team, there is no one I would be uncomfortable driving with. @chegs17_18 Had an unbelievable weekend at the Meet of Champs! Annie Behm- 200 free 7th Grace Yoon IM- 1st Karolyn Merch IM-12th Annie Behm back- 4th Grace Yoon breast - 1st 400 free relay -4th Medley-2nd Broke 5 Swim records! The Sun: Let’s go through a quick round: favorite song? Yoon: I don’t think I have one right now. Yoon: I can do a TV show. The Sun: OK, that works. The Sun: That’s a classic. Do you have a favorite book? The Sun: … figure it out? Yoon: Yeah, and I was really nervous for that test because it was my first one of the year last year. The Sun: Last one: do you have any kind of motto you live by? Yoon: So, my motto is always just to try my hardest. Because I don’t want to look back one day and say, “I should have tried harder” or “I wish I would have done this.” Basically, the time I have now is just to go for it. So if I have a particular goal just give it everything I have and if I don’t succeed I can look back and know I tried my best and I can feel satisfied that way.